I have been blogging and running websites for almost 20 years. It has been amazing to watch the internet evolve. What is even more amazing is that anyone, INCLUDING YOU, can blog and make some real income from it. moms and dads, and friends, so that they can tap the immense and nearly incomprehensible opportunities that the internet represents. 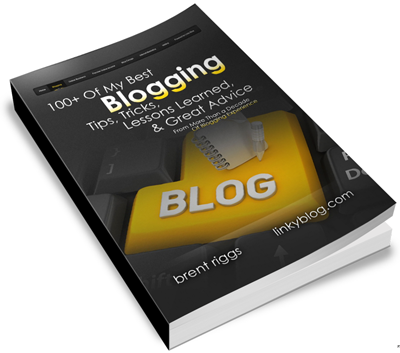 In this book, you will find a compilation of my best tips, tricks, lessons learned, and advice about blogging specifically, and indirectly about doing “on-line business.” The individual “tips” in this book are meant as both a compilation and as standalone tips. They can be read all together, or one at a time as you implement them. Over 100 quality mini-blog posts... plus some bonus tips at the end! Find successful bloggers and ask them to give you their cold, hard, and objective opinion about your blog. Better some sting now than failure later. Most people are afraid to get a hard-hitting objective evaluation of their blog. You should not be. Find a proven designer and ask them to critique your blog design, layout, and use of colors, fonts, and images. They may totally blister you but it is better that you hear that from one professional than have to discover it after two years of blogging failure. In the same manner, find or hire a professional writer and have them read a few of your posts and give you feedback. You may have to invest in professional editing help for a period of time as you strengthen your writing muscles, but it is worth every penny. Your blog will live or die on the quality of your writing, and yet most bloggers will not spend a penny to improve their writing skills and they get offended if someone tells them they could improve. If you are just getting started blogging, now is the ideal time to begin this evaluation process. Better to find out what is wrong with your blog, or your writing, while you only have a few posts and a few readers. With the evaluation in hand, you can work to correct any weaknesses as soon as possible and get started building a successful blog. Give them an offer they cannot refuse to sign up to your mailing list. e-mail fatigue with most people and it has gotten to a point where they simply will not sign up for your blog just because you ask them to. If you are an extremely good writer with a reputation for content that people just cannot do without, you may be able to get people to subscribe to your mailing list based on reputation alone. If you are not in that top 1% of elite bloggers however, you are going to need to offer some incentive for people to sign up to your mailing list. You might offer a free report, and e-book, or some sort of service that you provide or other valuable information for your reader. Most of the time you only get one chance to entice them to sign up for your e-mail list, so make sure you give it your best shot and offer them something they have a hard time refusing. Your blog post should reward the reader. When they are done, they should be glad they traded part of their life to read what you wrote. Always value your readers’ time. They only have a small amount to devote to blog reading and they have chosen to invest time in yours over the literally millions of other blogs out there. Never take that for granted. Make sure everything you write, everything you e-mail, and every communication you ask them to invest in is worth their time. Is it worth your time? Their time? If not, do not post it or send it. It takes a long time to build up trust, and just a few abuses or thoughtless episodes to begin to destroy it. Each time someone reads your post or e-mail, whether they articulate it or not, they should be able to state: I am glad I traded part of my life to read that.